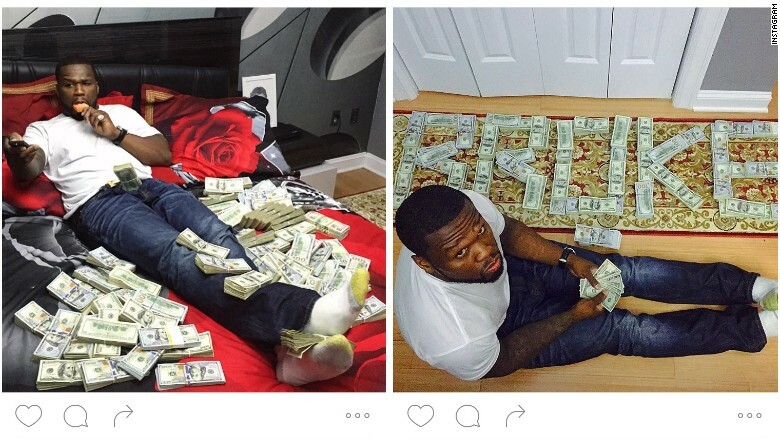 50 Cent has posted lots of photos surrounded by cash -- while he's in bankruptcy court. The rapper "50 Cent" is heading to court to explain why he's declaring bankruptcy -- while posting pictures of himself surrounded by cash on Instagram. Curtis J. Jackson III filed for bankruptcy in July. He claims that he still makes millions, but that a flood of expensive lawsuits is killing him. The guy who got famous for his 2003 album called "Get Rich or Die Tryin‍" has poked a lot of fun at his financial situation. But now U.S. Bankruptcy Judge Ann M. Nevins is worried the rapper is being outright dishonest. Since October, 50 Cent has posted several photographs on Instagram of him playing with cash. In one, he's in bed surrounded by dozens of stacks of $100 bills -- easily $50,000 in that picture alone. In another, he stacks the Benjamins to spell out "B-R-O-K-E."
In court on Thursday, the judge told the rapper's attorney: "I'm concerned about allegations of nondisclosure or a lack of transparency in the case." CNNMoney listened to audio recordings of the Hartford, Connecticut hearing. News of the hearing was first reported by The Wall Street Journal. "There's a purpose of having a bankruptcy process be transparent, and part of that purpose is to inspire confidence in the process," the judge said, adding that bankruptcy court is where "an honest but unfortunate debtor can come into court and seek relief." "When that process becomes very public, the need for transparency, I believe, is even higher," she told the rapper's lawyer, James Berman. Judge Nevins ordered the rapper to show up in court. On Friday, the rapper's legal team issued a statement saying he would show up "to make sure that all questions have been addressed." "Mr. Jackson has been forthcoming and transparent with all creditors," his lawyers assured. This issue was brought up in court papers filed in January by headphone maker Sleek Audio, SunTrust Bank (STI) and 50 Cent's ex-girlfriend Lastonia Leviston, three claimants in the bankruptcy case who say they're owed a combined $29 million. In court documents, they also say 50 Cent has posted pictures of huge public performances he probably got paid for -- even though he hasn't reported that to the court. They also pointed out that 50 Cent never admitted he owned property that he later disclosed on Instagram, saying: "My crib is almost finished in AFRICA. I'm gonna have the craziest housewarming party ever." The trio said the rapper also hid in court papers the fact that he trademarked the valuable "50 Cent" brand back in 2004. CNN's Sonya Hamasaki contributed to this story.